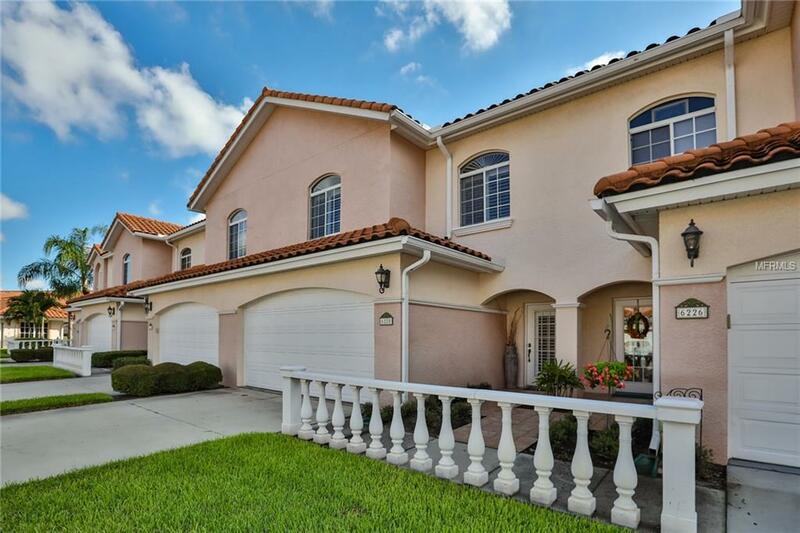 Fall in love with this elegant townhome located in the Gated Community of Villas Del Verde. This 3-bedroom 2.5 bath, 2 car garage Town House shows like a model home, expertly staged with many upgrades throughout. Beyond the formal entry foyer, youll find a large open floor plan, with a formal dining area & spacious living room featuring high ceilings, 5 base boards, recessed lighting, plantation shutters, tasteful tile & hardwood flooring. The renovated Chefs kitchen offers gorgeous granite counters, an enormous breakfast bar, SS appliances, tile backsplash & under cabinet lighting. Off the kitchen is a dinette area with French doors that open to a secluded lanai & lush tropical landscaping. Travel upstairs to the 2nd floor where you will find lovely hardwood flooring, two spacious guest bedrooms, a tastefully decorated hall bath & a utility space w/ a full-sized washer/dryer & wash sink. The ample (16 X 22) master suite offers a spacious master bath with double sinks, deep garden tub & separate shower. There is lovely Juliette balcony off the master bedroom, a great space to enjoy your morning coffee, plus two large walk-in closets, one closet has been converted to an office with a built-in desk & shelving. The Community offers a 60 Pool, Spa, fully equipped clubhouse & fitness center. Fabulous location, only 5 mins to area beaches & downtown Gulfport, 10 mins to downtown St. Petersburg, I-275 with easy access to Tampa Intl Airport. Note: Many of the furnishings in this lovely home are negotiable. Additional Lease Restrictions Application Required. Please Contact Resource Property Management With Questions 727-864-0004. Pet Restrictions No Aggressive Breeds. One Large Dog (Up To 100 Pounds) Or Two Dogs Weighing Up To 50 Pounds Each.